Backyards Plus is the Outdoor Living Headquarters of Denver and the Front Range. 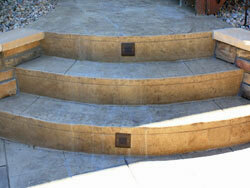 Consult with our design specialists about yard rennovation in the Denver area. We specialize in both residential and commercial projects. Backyards Plus does landscaping, fire pits, outdoor fireplaces, outdoor kitchens, retaining walls, boulders, and more We also carry the Vermont Castings Signature Series, Luxor, Solaire and Fire Magic BBQ grills. Backyards Plus has 30 years of experience. There isn't anything we haven't done; whether it's a $250,000 project, or a $2500 project, we can competitively bid your project against any, and all other local landscape companies. See hundreds of pictures of artificial grass, boulders, decks, fire pits, outdoor fireplaces, flagstone installations, landscaping, outdoor kitchens, pavers, pergolas, retaining walls, seating walls, stone steps, and stamped concrete. Backyards Plus installs, maintains and repairs stamped concrete and gray concrete in Denver and along the Front Range. Stamped concrete allows you to achieve an affordable, custom look in your outdoor living areas. It is often the most cost effective way to create a visually stunning outdoor living space. Stamped Concrete is a decorative technique that is applied to a "fresh pour" of concrete that simulates stone textures and surfaces. Stamped concrete is used for patios, sidewalks, walkways, and driveways. Backyards Plus has the absolute best value for stamped concrete and gray concrete in the Denver area! Our craftsmanship and quality minimizes the possibility of cracks over a long period of time. Our proprietary concrete mixture is extremely dense and we strengthen it further by using rebar in every installation. Most importantly, we stand behind our one-year workmanship warranty - give us a call at (303) 635-0085 for our warranty details. Additionally, you can always find us at our outdoor showroom at Jared's Nursery unlike other contractors who only work out of their truck. If your existing concrete needs resealing and you can't reach the contractor who originally poured your concrete we can reseal it for you. We have heard nightmare stories from homeowners about how their stamped concrete driveway started off an attractive brown hue and then gradually faded into an undesirable pink color. This is due to the contractor using an integral colored concrete, which is mixed inside the cement truck. Quality control is very difficult to maintain with integral concrete, that's why we USE COLOR HARDENERS! Only on rare occasions is it necessary to use integral concrete. Cleaning and sealing stamped concrete created with color hardeners should be done on a regular basis to combat fading. The frequency will depend on how high a traffic area to cars, foot traffic, water, and any chemicals the concrete is exposed to. Resealing is a personal preference. It depends on how high of sheen you like. We recommend resealing every 2 or 3 years. Like waxing a car, resealing your stamped concrete will make the colors as vibrant as the day they were installed. Will Your Stamped Concrete Crack? 1. Many years of hands-on experience, advanced technologies, excellent customer service and communication, superior attention to detail, licensed and bonded. d. More natural "stone look"
BEWARE of those who skip one or more of the steps listed above. Our reinforcement process is the benchmark for quality in the industry. Rebar provides the very best in protection against cracking for the long term. If done correctly, stamped concrete should easily last 10 to 20 years. A lot depends on expansive soils and proper maintenance. Like all concrete hairline cracks may occur, but our system is double reinforced, which greatly minimizes cracks. Maintenance involves the occasional cleaning and resealing of the stamped concrete. If resealing is done every 2 or 3 years the colors will remain vibrant throughout the life of the surface. BEWARE OF COMPANIES WHO DO NOT OFFER A WARRANTY, WHO HAVE NOT HAD A POSITIVE ON-LINE PRESENCE FOR A NUMBER OF YEARS , OR DO NOT HAVE A SHOWROOM. THEY MAY CHARGE LESS, BUT YOU MAY NOT BE ABLE TO LOCATE THEM IF PROBLEMS ARISE! THERE ARE MANY DISASTER STORIES WITH IMPROPERLY INSTALLED STAMPED CONCRETE! Our minimum is 400 square feet. Our cost for stamped concrete averages around $12 per square foot (depending on the size, slope and accessibility). We are priced below mid-range when competitively shopping while maintaining the ABSOLUTE HIGHEST QUALITY AND UTILIZING THE LATEST TECHNOLOGICAL ADVANCES!